This new puppy checklist will help you get ready for bringing home a new puppy. 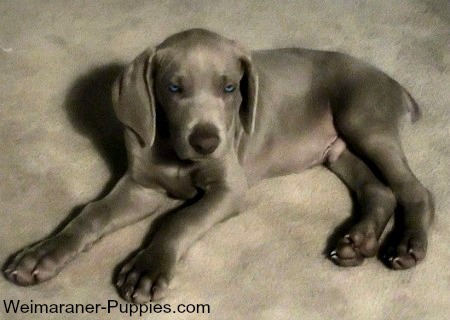 If you are prepared, your Weimaraner puppy will be more likely to adjust smoothly to your family. In other words, if you want things to go well when you bring your new puppy home, you need to decide now, what you need for your new puppy. And you need to have the appropriate puppy equipment waiting for your new dog! You’ve made the appointment to pick up your new puppy. Everyone is anxiously watching the clock. She will soon be here and will be part of your family in a few short hours. get organized for your new arrival. This new puppy checklist is for very basic puppy supplies and equipment that you must have before bringing home your new puppy. The list does include some puppy supplies that would be nice to have—to make your life a whole lot easier! Puppy bowls – for food and water. This slow feed dog bowl was designed to prevent dog bloat, a condition that Weimaraners who eat fast, can develop. The bowl slows down your dog’s eating, so he is less likely to get bloat. Also consider getting a Pet Feeding Mat. Large breed puppy food – Ask the breeder what your puppy has been eating. Make sure you have some of the same kind of food to get him started. Later, if you want to feed her another brand, you can transition over to the new food. This is very important because you don’t want to cause your new puppy to have digestive problems like diarrhea. You all have enough to adjust to—don’t add a problem you don’t need! Puppy pen for night time – a travel pen works nicely for this in the very beginning. Your puppy will feel safe and secure in his little “cave” and he won’t be able to roam at night. Since he isn’t house-trained at this point, keeping him in a secure location is an important consideration. And this can double as a crate to take your new puppy to the vet’s. Puppy collar – Even at this very young age, you need some way to get a hold on your puppy, for his safety. Puppy leash – Yes, even when your puppy is little, you will want to control him. He will not necessarily come to you when you call him, and you don’t want to have him run in front of a car or otherwise get into a dangerous situation. Large breed puppy crate for daytime use – If you intend to use a crate to potty train your new puppy, you should have this ready before you bring him home. If you purchase a large crate that you will use when your puppy is older, make sure that there is a divider. 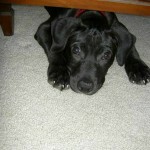 A divider will define your puppy’s living space and make potty training easier. Your puppy should be able to easily see what’s going on, from this dog crate. Pet ID Tag – Whether you decide to use a dog ID tag or a microchip, you will want to make sure that someone will call you if your puppy gets lost. This kind of ID includes ingraving of 4 lines of personal info, so that your puppy will be returned to you! Puppy jacket – If you live in an area that gets cold, your puppy may need some extra insulation. Since it is really hard to estimate your puppy’s size, make sure you measure him before you go to the store to get his sweater. Sweaters and jackets usually are sized by inches, not pounds. Also, remember that puppies grow really fast! As soon as you have your new puppy situated, you will want to consider getting him some dog grooming supplies on the next new puppy checklist. Fortunately grooming for a Weimaraner dog is very basic. Weimaraners are low maintenance dogs, but you will need a few dog grooming supplies to keep your dog in tip top shape. Dog Nail Clippers – Thinking ahead, make sure you get a set that will cut a large adult dog’s nails. Puppy shampoo – needs to be gentle and made for puppies. Puppy conditioner – oatmeal helps soothe a Weimaraner’s sensitive skin. 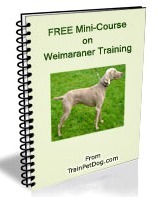 Learn about Weimaraner grooming in this free mini-course! Puppies are full of curiosity and lots of energy. That combination can be dynamite. So we, as the adults or the pet parents, must protect our little ones. Safety gates – If you have a two story house, you should protect your new puppy by placing a gate at the top of the stairs. Also, if you want to confine your puppy to certain rooms, you should have the gates in place before he arrives. Containment fence – electrical or otherwise. This is so that your puppy doesn’t run into traffic or wander off and get lost. Some containment systems, like this one, can even be used for keeping your dog away from forbidden indoor areas in your home. 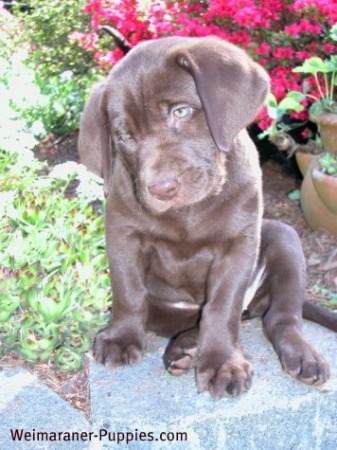 Eliminate poisonous plants and substances from areas the puppy can access. Dog playpen – to give your puppy a change of scenery. You can use a dog playpen indoors or outside. Now that you’re ready for puppy safety, take a look at the new puppy checklist for fun. Toys are more than just amusements for your puppy. They can help your puppy learn about his world. 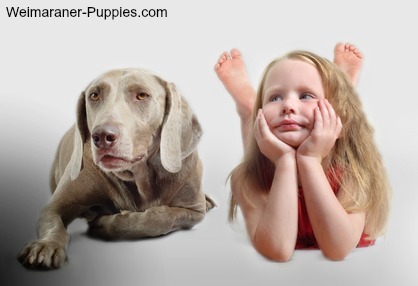 And they are a wonderful way to teach your Weimaraner puppy what he can and cannot chew. Much better than a chair leg! Puppy dental toys – also can keep your pet’s teeth and gums healthy. They help to remove tartar and food from your pet’s teeth and gums. Puppy toys will help your new dog to make discoveries about his world. He uses toys to learn about smells, textures, tastes and sounds. And the squeaking of a toy can spark the instinct in a hunting dog like a Weimaraner. Last, but certainly not least, they do keep a puppy amused. Our dog, Skipper, will bat a ball with her nose or chew on a squeak toy for long periods of time. Skipper’s favorite toy is a plush duck, “Ducky”, and she will play with him by throwing him into the air and then chasing him for 20 minutes at a time. Later, after she is tired, she will lay her head on Ducky and they will doze off together. They have become best buddies. I hope this new puppy checklist helps you get ready for your new puppy.